Advanced Carbohydrate System (Maltodextrin, Crystalline Fructose, Dextrose, Alpha-L-Polylactate), Citric Acid, Natural Flavors, Malic Acid, Xanthan Gum, Turmeric Powder (Added For Color), Stevia Extract, Soy Lecithin. Advanced Carbohydrate System (Maltodextrin, Crystalline Fructose, Dextrose, Alpha-L-Polylactate), Citric Acid, Natural Flavor, Malic Acid, Xanthan Gum, Caramel Color (Add Ed For Color), Stevia Extract, Carmine (Added For Color), Soy Lecithin. Advanced Carbohydrate System (Maltodextrin, Crystalline Fructose, Dextrose, Alpha-L-Polylactate), Citric Acid, Natural Flavor, Turmeric Powder (Added For Color), Malic Acid, Xanthan Gum, Stevia Extract, Soy Lecithin, Carmine Color (Added For Color). Advanced Carbohydrate System (Maltodextrin, Crystalline Fructose, Dextrose, Alpha-L-Polylactate), Natural Flavors, Citric Acid, Malic Acid, Xanthan Gum, Stevia Extract, Carmine (Added For Color), Soy Lecithin. Advanced Carbohydrate System (Maltodextrin, Crystalline Fructose, Dextrose, Alpha-L-Polylactate), Citric Acid, Natural Flavors, Malic Acid, Fruit And Vegetable Powder (Added For Color), Xanthan Gum, Stevia Extract, Carmine (Added For Color), Soy Lecithin. Advanced Carbohydrate System (Maltodextrin, Crystalline Fructose, Dextrose, Alpha-L-Polylactate), Citric Acid, Natural Flavors, Malic Acid, Xanthan Gum, Caramel Color (Add Ed For Color), Stevia Extract, Carmine (Added For Color), Soy Lecithin. Advanced Carbohydrate system (maltodextrin, crystalline fructose, dextrose, alpha-l-polylactate), citric acid, malic acid, natural and artificial flavor, l-alanine, l-glutamine, guar gum, xanthan gum, turmeric powder (added for color), stevia (rebiana). Mix 1 stick (25g) into 10-12 fl-oz water or mix 2 sticks (50g) into 20-24 fl-oz water. Begin drinking 15 minutes before exercise. Dink 5 oz. every 15 minutes. Advanced Carbohydrate system (maltodextrin, crystalline fructose, dextrose, alpha-l-polylactate), citric acid, natural and artificial flavor, malic acid, l-alanine, l-glutamine, guar gum, xanthan gum, stevia (rebiana), caramel color (added for color), carmine (added for color). Advanced Carbohydrate system (maltodextrin, crystalline fructose, dextrose, alpha-l-polylactate), natural flavor, citric acid, malic acid, xanthan gum, stevia extract, carmine (added for color), soy lecithin. To view the Cytomax study click HERE. 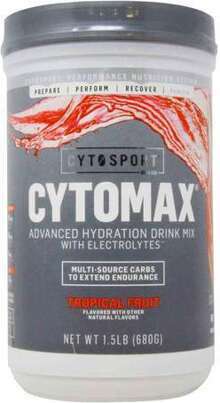 Cytomax mixes easily with water and tastes delicious! And at up to 82 serves in one container, it's also a great value!